On Jan. 15, legendary surfers took on Maui's skyscraper-sized waves. The best-case scenario was an epic, record-breaking ride. The worst was death. ith the grace of a surgeon, legendary big-wave surfer Shane Dorian applies a fresh coat of wax to his custom 10-foot-6-inch surfboard. His lifelong friend Ian Walsh does the same just across the pingpong table -- their makeshift workbench. The two talk about the weather and the spaghetti and meatball dinner they plan to eat that night. One might think it's just another Thursday afternoon on the North Shore of Maui in mid-January. But just a couple of miles away at the surf break Jaws, aka Peahi, waves in the 80-foot range are bearing down, and Dorian and Walsh are preparing to paddle in and ride these giants the next day. And nobody knows exactly what to expect from Jaws. Not even Dorian, who first paddled into Jaws in 2010. "I was pretty nervous and scared of how big it was gonna get," the 43-year-old says. "The worst-case scenario at Jaws is definitely death." Friday morning arrives, and without the typical Maui trade winds, it's hot and there's not a cloud in the sky. Today, on Jan. 15, Jaws is breaking big and clean. Dorian would later call the swell historic: "Definitely the biggest we have ever paddled, by far," he said. Personal watercraft, such as Jet Skis, and boats steadily trickle into the safe zone, and Dorian, Walsh and about 20 other surfers, including Oahu's Aaron Gold, local Kai Lenny and California's Greg Long, are starting to paddle in. Someone in the crowd on the cliffs above Jaws shouts, "Hey, that's Dorian paddling out!" And everyone knows it's on. But it's Gold who catches what experts are unofficially calling the biggest wave ever paddled into. "I struggle to put specific size to it, but an estimate puts it at eight times his board length, which would make it 80-plus feet," says Tom Carroll, big-wave legend and former two-time world champ. 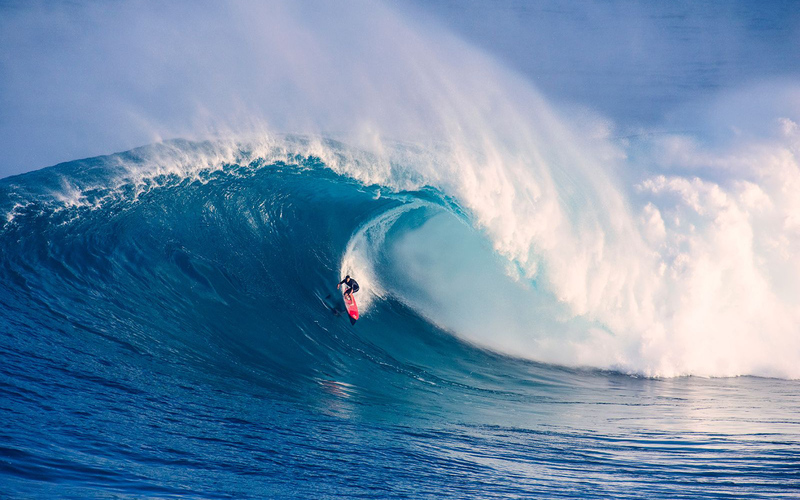 Shawn Dollar holds the official record for the biggest wave (paddle in) at 61 feet, ridden in 2013. "It was my first wave," 34-year-old Gold says. "I thought I'd catch a small one -- and it just came to me. It definitely was one of the longest drops I feel like I've ever had. Where I thought it would end, it had a whole other section to it. [At the end of the wave] I got rag-dolled. It's always a beating out there." But that won't keep Gold -- or Dorian or those 20 other surfers for that matter -- from coming back for more when the next big swell is predicted at Jaws. Longtime best friends Shane Dorian, left, and Ian Walsh, aka Walshy, prep their boards and gear on Jan. 14, the evening before a record day at Peahi, aka Jaws. The biggest sets of waves didn't arrive at Jaws until around 2 p.m. local time on Friday, Jan. 15. "The swell and hype crept up, which helped a lot," Walsh says. "The wind got better with every six-hour forecast. Having the swell gradually build throughout the day, too, I think helped out a lot. It gave us a chance to eat a real breakfast and feel prepared instead of the usual throwing whatever you can in your mouth and racing out there." Dorian, 43, has been called the Swiss army knife of surfing. The versatile pro surfer from Hawaii's Big Island is arguably his generation's best paddle-in big-wave surfer. Spectators in the thousands braved the narrow dirt road to pack the cliffs overlooking Jaws and were treated to what many are calling the best day of surfing at Jaws in more than a decade -- or, some would say, ever. "Peahi is for me the most special place in the world," says 23-year-old Kai Lenny, who grew up in Maui. "The mana [Hawaiian for power] of the area alone speaks to me. Once the wave begins to break, I feel like there is no place on Earth I should be but on a wave out there." Albee Layer, Maui's own, drops into a glassy, sapphire-blue barrel as others wait in the wings for more waves to roll in. Pristine conditions ruled the day on the island of Maui, which is typically very windy. Huge surf with favorable local conditions -- and perfect glassy waters -- is a rare thing at Jaws. "I can't remember ever seeing Jaws so big and clean, not even during the tow days 15 to 20 years ago," Dorian says. I've never seen big waves like that in my entire life; some of the waves that came through were just mesmerizing." Oahu's Aaron Gold nabbed the wave of the day, which some experts are claiming is in the 80-foot range. Big-wave legend and two-time world champ Tom Carroll agreed with claims that Gold's wave is the biggest wave ever paddled into. The worst-case scenario is to get caught inside when a set of waves the size of skyscrapers rolls in. The surfers in the field are constantly paddling and repositioning themselves to stay out of the impact zone. Dorian outruns an angry wall of water moving faster than a freight train. "It doesn't matter how much training you do. It doesn't matter how prepared you are or how much safety equipment you have: If it's the wrong situation, that's it for you," Dorian says. At 22 years old, Oahu native Koa Rothman -- whose older brother is pro surfer Makua Rothman -- is clearly a standout in the younger generation of big-wave surfing. Dorian tests his V1 inflatable wetsuit for safety the afternoon before the big swell hits Jaws. Dorian helped develop this wetsuit after nearly drowning at Mavericks, a legendary big-wave surf break in Northern California, in 2010. Dorian looks for an exit strategy on his second wave of the day at Jaws. Unfortunately, Jaws closed on him and swept Dorian into the impact zone, the most dreaded place for a surfer to sit. The consequences of a fall in the wrong place can be deadly, and Dorian doesn't gamble. He has hired DK Walsh and the Skullbase crew to run safety for him. A tight rescue in the impact zone warrants a hug from Dorian. "We have a very organized safety plan, with good people in place to watch us. The dangerous part is there are so many people out at Jaws -- and only a few water-safety guys. Each water-safety guy is watching the surfers that have retained them. They can't go save every guy who goes down. People who jump off the rocks with no safety plan have to know this and plan accordingly." According to The Encyclopedia of Surfing, "The surf world at large got its first look at Jaws in the September 1994 issue of Surfer magazine (although the break was identified only as a 'heaving, deep-water outer reef in Maui')." Since then, Dorian has walked this path down to the famed break many times. "I felt really comfortable, and having a bunch of days out there surfing and having a big board under your feet helped my confidence leading up to this swell," says Walsh, who barely escapes as the barrel closes behind him. Lenny scores more waves than anybody -- but doesn't escape Jaws on this wave. A lively crowd packs the cliffs above Jaws, hooting and hollering with the progression of each massive breaking wave. Lenny is a true waterman. He learned how to surf at the age of 4, windsurf at age 6, stand-up surf at 7 and kite surf at 9. Lenny's favorite wave is Jaws, and he knows when it's time to bail. "I have been watching the spot for my entire life," he says. "Most of my earliest memories are of that wave. I know there are a lot of people who share the same connection I do. We should all be so fortunate." Jaws is a wonder of nature that only a select few surfers will ever experience. But a ride can turn into a nightmare in an instant, pulling the surfer down into the depths below. "It was nasty," says Gold after this fall Friday. "It's always nasty, and I'm just thankful that I came up in all in one piece." Starting in the 1990s, tow-in surfing was the norm for big-wave surfing. But in 2010, a cast of big-wave characters including Dorian (pictured), Walsh, Greg Long, Danilo Couto and Sion Milosky paddled into -- and survived -- Jaws without the use of a personal watercraft. "Big-wave paddle surfing has come a long way in just the last couple of years," Dorian says.